The neurological patient that develops respiratory failure usually has obvious neurological disease. Intubation is always indicated in respiratory failure associated with decreased ventilation. 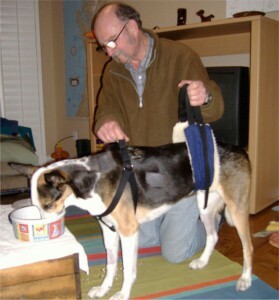 Once the patient has been stabilized, the lesion must be localized. This will help the clinician establish a list of differential diagnoses and the general prognosis for the patient. If the disease is treatable owner commitment and expectations need to be explored as these cases can require long-term intensive management. Intubating the patient and initiating ventilation is the first step. The next stage is planning the diagnostic work up and treatment procedures. This helps establish whether a resolution of the underlying disease process is feasible and may aid in providing owners with an estimated time for successful weaning from the ventilator. Unless the cause can be alleviated rapidly (ie – naloxone in the case of narcotic ventilatory drive depression), cases associated with poor thoracic excursions, usually require longer term ventilation. Without the presence of co-morbidities, neurological patients usually have normal lungs. 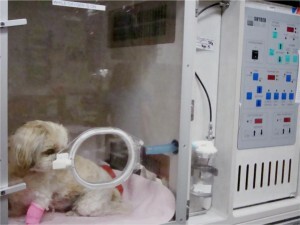 These patients are easier to ventilate but lung protective techniques are indicated to prevent ventilator associated lung injuries and complications including ventilator associated pneumonia are still possible.Mechanical ventilation is a method used to either assist or replace spontaneous breathing. Mechanical ventilation can either be a person compressing a bag (hand controlled ventilation) or may involve a ventilator. The early ventilators were developed in the 1950s during the polio epidemic. Polio caused respiratory paralysis and patients were kept alive with manual ventilation by medical students. The first ventilators were called “mechanical students”. Anesthetic options for short-term ventilation (i.e. less than 3-4 hours) depend largely upon the type of ventilation system used (i.e. 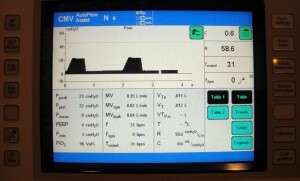 ventilation with anesthetic machine, manual ventilation with a resuscitation bag, automated ICU ventilator). If the patient is being ventilated using an anesthetic machine the patient can easily be maintained using inhalant anesthetics with the dose being adjusted to maintain adequate anesthetic depth and cardiovascular function. If an anesthetic system is not being used an intravenous anesthetic protocol (i.e. propofol) is often used to maintain the patient. During short-term ventilation maintenance of anesthesia does not need to be necessarily complex and unconsciousness can be maintained using a single drug (i.e. propofol or inhalant anesthetic) with perhaps a background sedative and/or analgesic. For longer term ventilation it is often not practical to use a single agent either due to financial constraints (i.e. 30 kg dog would need approximately 20-80 ml of propofol/hour) or side effects of a single agent (i.e. excessive cardiovascular depression). 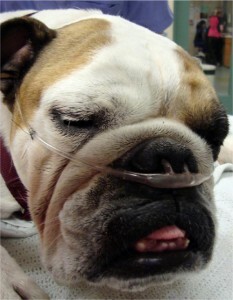 Anesthesia for long term ventilation most frequently involves propofol with various anesthetic adjuncts (i.e. opioids, muscle relaxants, sedatives) based on the needs of a particular patient. Protocols usually start with a “foundation” anesthetic, propofol and/or ketamine with mild muscle relaxants such as benzodiazepines (diazepam, midazolam), short acting opioids (fentanyl, remifentanil) and sedatives (acepromazine) are added as needed. Occasionally profound muscle relaxants such as atracurium are used but these should only be used if proper monitoring of neuromuscular function is available. 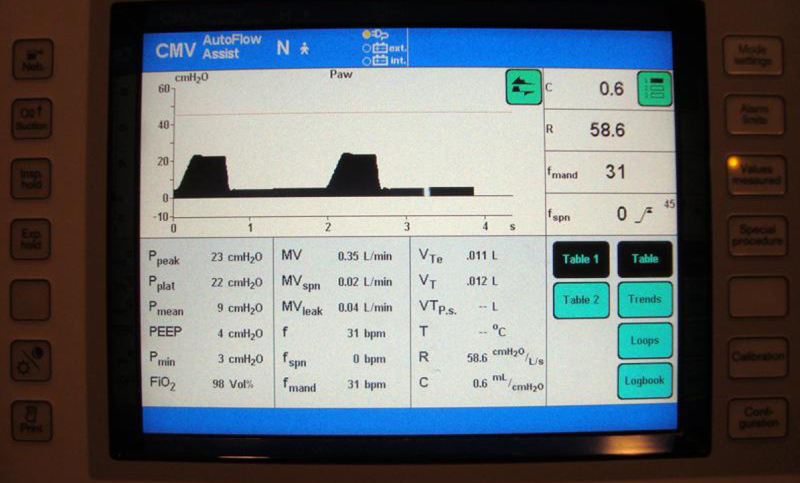 Regardless of the technique chosen, it is important to tailor the anesthetic protocol to the individual patient requiring long-term ventilation with dose and drug alterations occurring as dictated by the patient. It is not uncommon to find that some patients may require surprisingly more or less anesthetic drugs with increasing duration of ventilation. These changes are not very predictable and may be related to both changing physiological as well as pharmacological factors (i.e. metabolism, drug interactions etc). 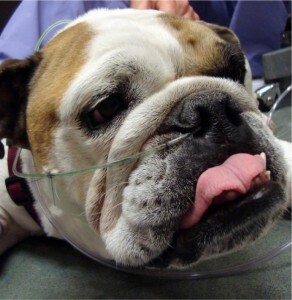 In addition to drugs there are many other techniques that can be utilized to improve patient compliance with ventilation. Ensuring the patient is kept in a quiet, comfortable environment also helps reduce anesthetic requirements during long term ventilation. Using cotton to plug the ears, providing good bedding and a means for the evacuation of the patients bladder without filling will all help during long term ventilation. The arrow indicates disc material (coloured ORANGE here) that was compressing her spinal cord, resulting in her paralysis. Kona is a eight year old female spayed Husky-Whippet cross presented for progressive tetraparesis. Her ventilating ability deteriorated soon after admission. 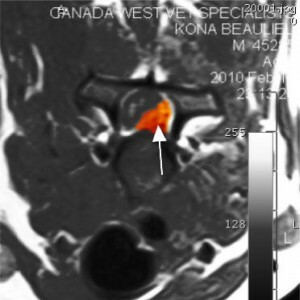 The neurological examination localized the lesion to the cervical spinal cord. 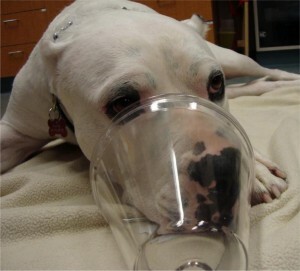 Kona was no longer able to breathe on her own. She required intubation and mechanical ventilation. An MRI was done and showed a large amount of herniated disc material at C4-5 and C5-6 that was causing dramatic spinal cord compression. A dorsal laminectomy surgery was performed to remove the disc material and decompress the spinal cord. Kona needed continued ventilatory support for two additional nights before she could be weaned off the ventilator. She continued to slowly improve over the next ten days. but she was unable to stand. She was walking and trotting six weeks after surgery. The causes of respiratory failure associated with increased rate and effort are numerous and can be categorized by their location. Airways – large to small, chest wall, pleural space or parenchymal abnormalities. In general, causes are obstructive in nature. In addition to increased effort, clinical signs (stridor, voice change, cough character, increased inspiratory or expiratory effort, rapid/shallow breaths, pyrexia, increased or decreased lung sounds on auscultation) along with diagnostic work up help define possible etiologies. Almost all patients with increased respiratory effort benefit from sedation and oxygen therapy. Oxygen needs to be administered in a way that does not contribute to the patient’s distress. Thoracic radiographs are always indicated in the diagnostic work up but may precipitate a crisis if the anxiety of the patient is heightened with restraint. Patients in severe respiratory distress who do not rapidly respond to supportive care will likely benefit from intubation and ventilation to control their breathing and eliminate the struggle for each breath. Even if intubation is not anticipated, it should be available as well as the ability to provide ventilatory support. Technically, intubation and manual ventilation are not complicated in the immediate short term (it is like inducing anesthesia albeit in a sick patient). A rapid intubation sequence is required so that the airway can be controlled and it also allows for examination of the oropharynx/laryngeal area if the suspected lesion is at the level of the upper airways (allows the evaluation of the laryngeal function to rule in or out laryngeal paralysis, abscess or mass in the oropharynx causing an obstruction, elongated soft palate, everted saccules in the brachycephalic breeds etc). Intubation can help stabilize the patient, relieve respiratory distress as well as allow further diagnostic tests. The clinician must exercise caution in choosing sedative or inducing agents for the patient in respiratory distress. Hypoxemic patients have limited oxygen to deliver to their organs and therefore can not tolerate increased skeletal muscle oxygen demand. Increased skeletal muscle oxygen demand can occur with agitation whether the agitation is associated the increase in work of breathing or the stress of restraint, even minimal. This can lead to respiratory arrest. If time allows, pre-oxygenation is beneficial. Pre-oxygenation must be delivered in a way that is tolerated by the patient. We like to use flat bottomed masks. They do not roll, therefore they do not need to be held in place, which seems to be better tolerated by patients in distress. 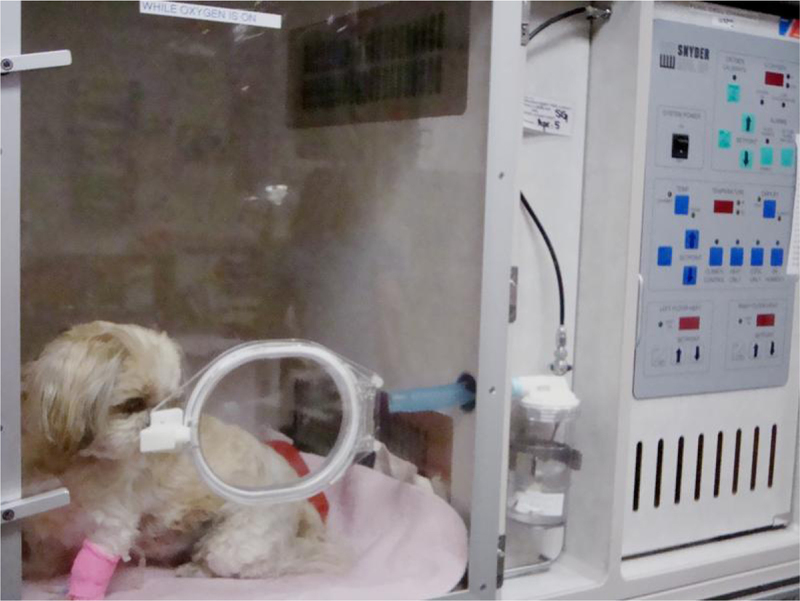 With cats or small dogs, we prefer the oxygen unit. The oxygen units allows the patient to receive up to 40% inspired oxygen with minimal restraint. It is an invaluable tool in critical care but there are some disadvantages with this type of unit. Some of the disadvantages of these types of units are that they can be noisy at times which startles cats already stressed by their disease process, they do not accomodate patients over 15 kg and their ambient temperature is not always easily controlled. Furthermore, they are expensive to purchase and to operate as they use a tremendous amount of oxygen in a 24 hour period. Human prongs fit medium to large dogs and are associated with less discomfort at the time of placement. We find them useful in the patient that do not tolerate nasal canulas. Typically, the inspired oxygen achieved is less than a nasal canula. Nasal canulas are generally well tolerated by most patients once it is placed but the procedure itself is not always well tolerated. Butorphanol is often chosen as most opioids can cause nausea. If we feel butorphanol (accompanied or not with acepromazine depending on the cardiovascular status of the patient) may not provide enough effect, an opiod is chosen. Fentanyl is a good choice (less likely to cause tachypnea or nausea) but requires IV access. Patients with severe respiratory distress may be too anxious to allow placement of an IV catheter. The choice of induction agent is dependant on the disease process and the comfort of the clinician: We generally use a ketamine/diazepam combination or propofol. Propofol is more predictable but it does have a tendency to induce hypotension and respiratory depression at the time of induction. Critical patients are not very tolerant of errors. Preparation and familiarity with the drugs chosen are key. Almost all patients with increased respiratory effort benefit from sedation. Patients in severe respiratory distress benefit from intubation and assuming control of their breathing. Caution has to be exercised with the drugs chosen. This chronic, progressive and debilitating condition is most commonly found in toy breeds. Clinical signs can be cough (typically described as honking), retching, dyspnea which are aggravated by obesity, exercise, heat and excitement/anxiety. Whenever possible, aggressive medical management should be attempted as the interventional techniques are rescue procedures and therefore only recommended when more conservative therapies have failed. 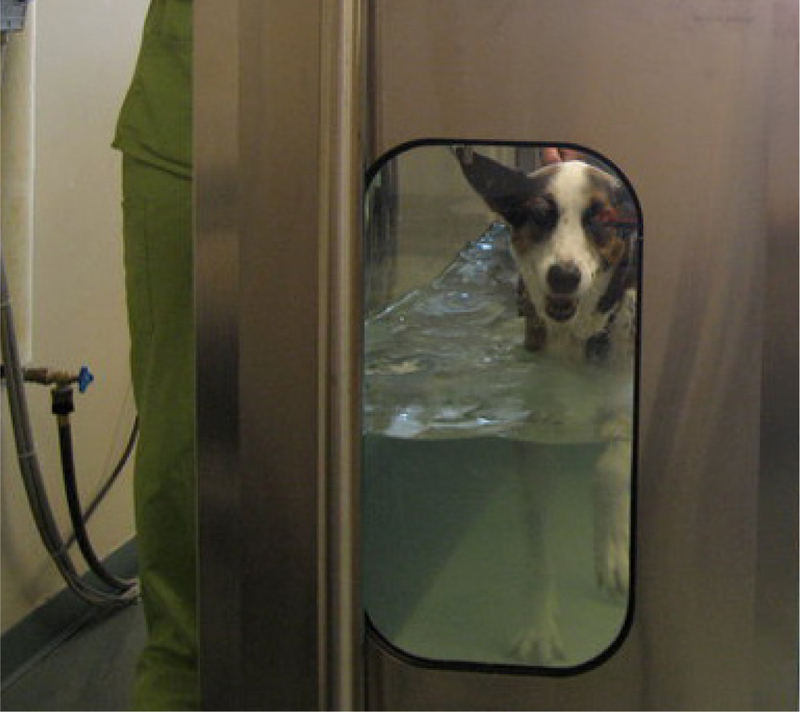 Sedation and oxygen therapy may be required on admission to relieve patient distress. 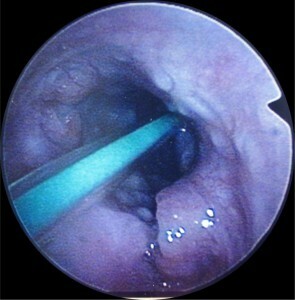 Once intubated, unless the tracheal collapse is addressed, these patients are very difficult to extubate successfully. Long term medical management typically involves the use of a harness, weight loss, cough suppression, and bronchodilators. We have found that cough suppression with Hycodan is the most effective treatment. 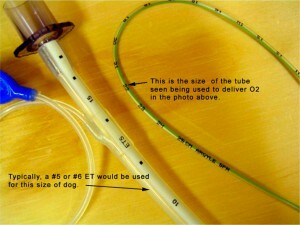 The two most common techniques to address collapsing tracheas are intralumenal stents or external prosthetic polypropylene rings. We no longer use stents because of the high morbidity and mortality rates. Stent fracture usually occurs and euthanasia is often the only option due to tracheal obstruction from granulation tissue. In the patients who develop exhuberant granulation tissue, repeat endoscopies are frequent as well as ongoing infections. Fractured stents can be splinted with another stent. It may be that we consider this option again in the future if different stents were available. The cases that are prone to developing excessive granulation tissue would likely have to be on long term chemotherapy. Methotrexate has been documented in the human litterature. Polypropylene ring placement is limited to the cervical trachea and very proximal thoracic portion. Prognosis is only fair to good. Laryngeal paralysis and ongoing intrathoracic tracheal and bronchial collapse are common complications. Commercially available rings are recommended (vs. home-made version from syringe cases). Aggressive medical management is preferred. The interventional therapies are rescue procedures and have significant morbidity and mortality. Our current treatment of choice: placement of external rings. This technique is only effective for the cervical tracheal collapse.